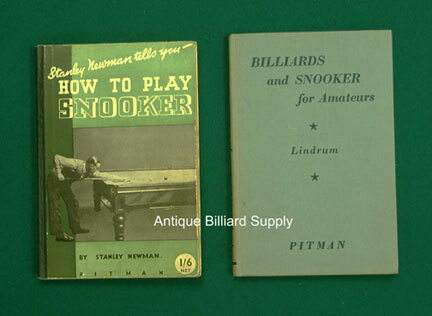 #12-12 "How to Play Snooker" by Stanley Newman (left) is a second edition published in 1936. The introduction is by billiards champion Tom Newman. Contains numerous photos and diagrams and tips for players of all abilities. Sections devoted to mechanics, rules. and techniques of the pros. 81 pages, about 5 inches wide and 7 inches tall. Good condition. $40. "Billiards and Snooker for Amateurs" by Horace Lindrum is a great addition to any historical billiard library. First published in 1937, this thoroughly revised 1948 edition includes numerous drawings and diagrams throughout the 117 pages of helpful tips for casual players. About 5 inches wide and 7 inches tall. Excellent condition. $35.